The low cost wedding BBQ catering service from Que Fresco will still make your special day something different and a day to remember. More and more couples are looking for a day with a difference and we aim to help make your special day just right. What makes our low cost wedding BBQ catering service stand out is that our chefs are trained to cook over charcoal, in fact, we don’t do anything else. We’re not kitchen chefs who light a barbecue when required (and burn everything), we cook over open fires week in week out 52 weeks of the year…and we love it! A lavish wedding breakfast with canapés, main course, dessert and cheese board. For your exclusive day to remember please select our full set menu and a la carte options. Our low cost service below is ideal for evening munchies such as sausage, burgers and pulled pork and spit roasts. Our low cost wedding BBQ catering is perfect for your evening do and designed to be informal and FUN! Don't forget, it doesn't matter where you are, we travel the length and breadth of the UK too! Slow roasted with salt ﬂakes, delicious golden crackling. Served with garlic & rosemary roast potatoes, sage & onion stufﬁng, Bramley apple sauce, onion gravy & soft ﬂoured bread rolls. Cuban spiced hog, orange, oregano, fennel & chilli. Served with spicy chorizo sausage, sweet potato fries, rocket leaves & ciabatta bread. Seasoned with rosemary, chilli, garlic, bay, fennel, black pepper & smoked salt ﬂakes. Served with creamy mayo spiked with trufﬂe oil, shaved parmigiano reggiano cheese, rocket leaf, sauté potatoes & ciabatta bread roll. Rubbed with garlic & rosemary & brushed with mint ,lemon, thyme & honey. Served with goose fat roasted potatoes, herb stuffing, mint mojo sauce & ciabatta bread rolls. Rubbed with Jamaican curry spices, served with lettuce & onion in a wrap & drizzled with coriander & yoghurt sauce. Tender Angus salt beef, slow cooked over charcoal & hickorywood. Served with curly fries, rocket, horseradish cream, crispy onions & soft ﬂoury bread rolls. Rubbed with juniper, bay & garlic. Basted with smoked streaky bacon & served with red currant & port sauce, roasted potatoes & ciabatta bread rolls. Tender chunks of Tandoori chicken cooked in our charcoal clay oven. Served in pitta bread with salad, onion bhaji's & minted yoghurt sauce. Build your own pizza, you choose your toppings & we stone bake it. Delicious freshly fried ﬁsh & chips, homemade tartar sauce, cherry tomato ketchup, salt ﬂakes, vinegar, lemon wedges & soft ﬂoured bread rolls. In addition to tasty meats cooked low and slow, barbecue is about the atmosphere, the fire, the smoke and the company. It’s perfectly suited to a relaxed environment where barbecue meats are presented for guest to serve themselves and graze or for hunks of meat to be delivered to the centre of the table for guests to share. If you’re looking for a very traditional wedding breakfast with simultaneous individual service and cloches then click here. We can’t get away from it, BBQ is also about meat and savoury flavours in general (of course we do veggie menu options) so we don’t pretend to cook desserts anywhere near charcoal…and to be fair, it’s not what our wedding chefs do best. We work with a variety of respected local producers to add your choices of dessert and / or cheese to the menu. Moreover if you have a preferred choice of local producer for us to work with then we will be only too happy. We have BBQ catering menus to suit all pockets so a after a short discussion we will be please to send you a quotation that meets your desires from both a quantity and variety of food. Complete the rapid response form below to tell us what you need and we’ll get back to you with 24 hours. Alternatively call Paul on 01744 500755. 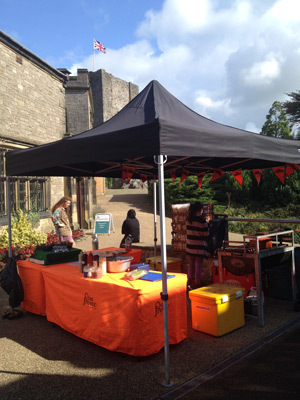 How Can Our BBQ Catering Business Help?